A utility bill is a statement sent by your energy provider to inform you of how much energy you’ve used and how much you will need to pay. A utility bill can also provide a lot of useful information about your energy usage and your current tariff. If you compare gas and electricity bills from one month to the next, or compare energy bills year-on-year, you can see how your energy use varies at different times to help give you a better idea of how you can reduce energy bills to save money. If you’re serious about cutting the cost of your energy bills, it makes things a lot easier if you can find your way around one - here's how to understand your energy bill. Make the switch with UK Power and start saving today. The average UK energy customer admits to finding gas & electricity bills overly complicated and, as consumers, we are becoming increasingly disengaged with the energy industry. In response to this perception, the energy industry watchdog Ofgem has embarked on a mission to simplify the energy market to improve consumer engagement. The most common point of contact many consumers have with their energy supplier is through their gas and electric bills. Energy suppliers use this limited space to portray a lot of important information that could be used to help you save money. This is why as consumers it is important that we properly understand how our energy bills are broken down. To help you better understand your energy bill, we have provided a walk through, indicating what information you can use to your advantage and where to find it. Use this guide as an energy bill comparison, to get a better understanding of your usage. Contact details for your energy supplier - This is where your supplier will list their contact details. It is good practice to keep these details to hand in case you need to query any discrepancies with your supplier. Customer reference number - Your customer reference number is usually required when contacting your supplier to help them quickly access your account. This number is unique to you, but it will change if you switch energy supplier. 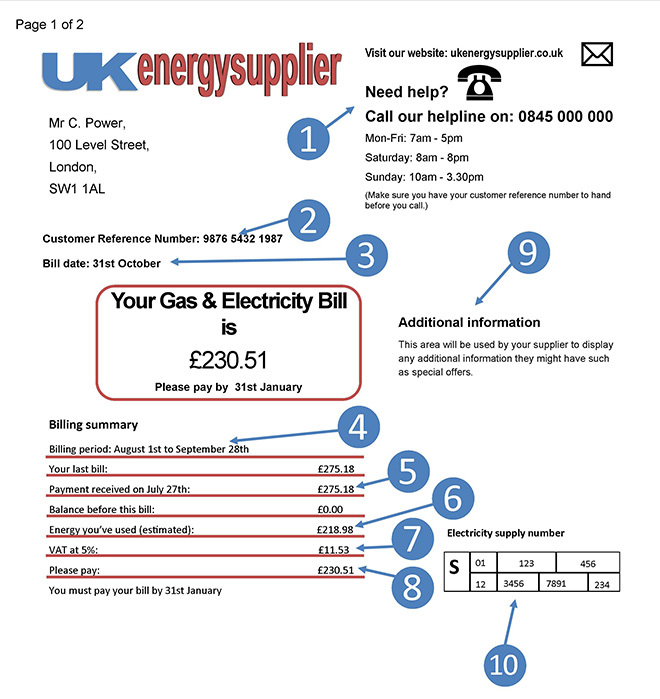 The bill date - The bill date indicates when your energy provider issued this bill to you. However, the length of time you will have to pay this bill usually differs between suppliers. Bill period - These dates indicate the period that your bill covers. It should run from the day after your previous bill period and not surpass any more than a year, providing you have made ample attempts to contact your energy provider. Last payment - This section is a reminder of how much you paid on your last bill. You may find this helpful to monitor the amount you pay between bills. You should expect a seasonal change to occur in your energy bills, however if you notice a drastic change in price it can indicate an expired tariff. If this is the case visit our energy comparison page to find a better deal. Bill cost before VAT - This is where your energy supplier will display the cost of your energy usage before VAT tax is added on. Amount of VAT added - Your energy supplier will then follow this by the amount of VAT tax that is added onto the cost of your energy. The total amount to pay - Finally, they will reiterate how much you’re required to pay, with the VAT tax added in. This figure should be the same as the one printed at the top of the statement, providing you’re not in credit or debt with the energy company. Additional information - Your energy supplier will often want to communicate new or expiring tariffs and even special offers they currently have running in this section. Supply number (MPAN) - Finally, your provider will include your supply number, which is sometimes referred to as your MPAN. It is a unique number that is issued to the property by your energy supplier, but it shouldn’t be confused with your customer reference number. Meter point reference number (MPRN) - This number is known as your MPRN and it is unique to you. It is used by your supplier to identify your property, but it remains constant between suppliers. Your MPRN is often required when you choose to switch energy providers. The name of your plan - Your suppliers should indicate which tariff you are currently on. If this is not provided, you should contact your supplier. It is important to note that energy providers will give a variety of names to their ‘standard’ tariff, so just because you’re tariff is listed as cheapest, there could be other less expensive options available. In this is the case use our tariff comparison page to find one that works for you. Energy usage breakdown - This section is used by your energy supplier to display how your bill is broken-down and detail what you’re being charged for. This section will also tell you if your energy supplier is working from an actual figure or an estimated reading when working out the cost of your energy bill. Specific requirements contact number - If you have any specific requirements with regards to your bill, this is where you will find the relevant contact number. Your energy bills can be provided in a number of formats including braille and on audio tape. You should use this information to contact your energy supplier for more information. Payment slip - Finally, a payment slip is included with your bill to provide a cash or cheque payment option. However, there a number of different payment methods available to you and some can even provide discounts on your energy bill. How does your energy supplier work out how much energy you use? There are a number of ways that an energy provider can interpret how much energy you have used. Sometimes your provider will estimate your energy usage based upon your previous bills. But this method of energy bills comparison is often inaccurate and can result in you being over or under charged for the energy that you use. And while being under charged means you’ll have cheaper gas and electricity bills for a time, your supplier will eventually catch up with you and you could end up owing them hundreds of pounds. If you think you might be in debt with your supplier, or you’re struggling to pay your energy bills, check out How to deal with energy debt. The preferred option is for your energy company to work out your bill from actual readings. This is when they send a representative to your premises to take a reading, or you provide them with one over the phone or via your online energy account. By doing this you’re providing the energy supplier with actual figures which will improve the accuracy of your bill. Your energy usage is seasonal so you will often over pay in the summer, but under pay in the winter, however, this is far from exact so it is recommended that you contact your energy provider every three months to keep them up to date with your meter readings. In cases where your energy provider doesn’t have this information, they will estimate your energy usage using the nation’s average gas and electricity bill. This method uses heavy assumptions and you can expect it to impact the accuracy of your bill drastically. Your energy supplier is allowed to charge you for any energy you use, however, if you haven’t received a bill in over a year and you have made acceptable efforts to contact your supplier then you can dispute your outstanding bill. Pre-paid meters - You can have a pre-paid meter installed which allows you to only pay for the energy you use. This is a pay as you go method that allows you to keep on top of your energy bills; however, it is by far the least cost effective method of payment due to the increased cost of managing and maintaining the meter. Direct Debit - The cheapest way to pay for domestic bills is by Direct Debit. Energy companies will often offer a discount to customers who choose to pay by this method because it guarantees payment and cashflow. You can choose to set up a variable or fixed Direct Debit depending on how much control you want over your outgoings. Standing order - Similarly, a standing order allows you to remain in control over how much you pay to your energy supplier. This allows you greater control over your finances, however, if you use over your budgeted amount of energy, then you could fall into debt, or alternatively, pay too much for your bill. 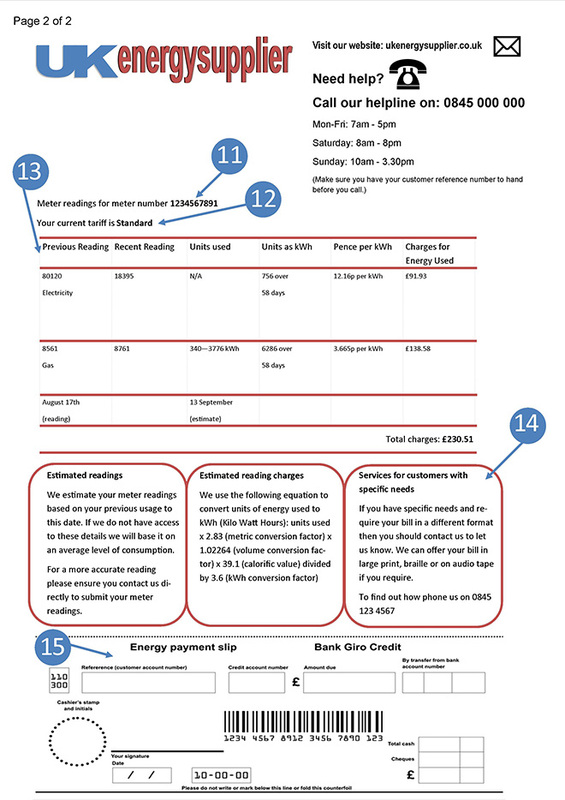 Giro slip - Finally, at the bottom of an energy bill your supplier will offer a giro bank slip which allows you the option to pay the balance of your bill with either cash or cheque. Traditionally you will not receive a discount for this method; however, some suppliers do offer a prompt payment discount. It is also important to leave enough time for the payment to arrive with energy supplier, or you may be charged a late payment fee. Your gas and electricity bills are the best way to gauge if you’re paying too much for your energy. If, after reading this guide, you find you’re paying too much for your energy, ukpower.co.uk can compare your tariff with other suppliers.